Scientists have developed a new ultrasonic sensor to help conserve and learn more about the endangered Ganges River dolphins. Till date most of the behavioral data on the dolphins has been compiled from research performed on captive animal but with this the situation will change. Known as the hydrophon system/ underwater acoustic device it has been developed by Professor Tamaki Ura at the University of Tokyo. Each device has five sensors that can chart the dolphins by tracking their tones, or clicks, that the blind mammals emit to navigate. The device can track the animals from up to a kilometre away without disturbing them. Computers can then take the data and reconstruct the movements of the dolphins so researchers can learn about their behavior. What dangers do these endangered dolphins face? Death from pollution in the river and the construction of dams, barrages along the Ganges River. 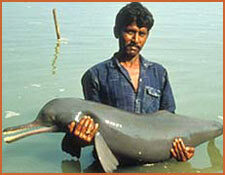 Habitat alterations caused by the proliferation of dams, which cuts off upstream migration of the dolphin and its prey. With just 2000 of these left in the rivers of the Indian Subcontinent and hardly any visible sightings either due to the murky waters or due to the depleting numbers this technology sure is a blessing. Blame climate change for India's dengue outbreak? ← Europe trying to save depleting fish stocks: Isn't it already a lost battle?